That’s a lot of emotion! His determination to not cheat on the dietary restrictions of his son stuck with me 30 minutes later, when I went to lunch. I walked into my favorite quick lunch spot: Specialties Cafe & Bakery. It was a relatively new store, and they had these tethered iPads for placing orders. 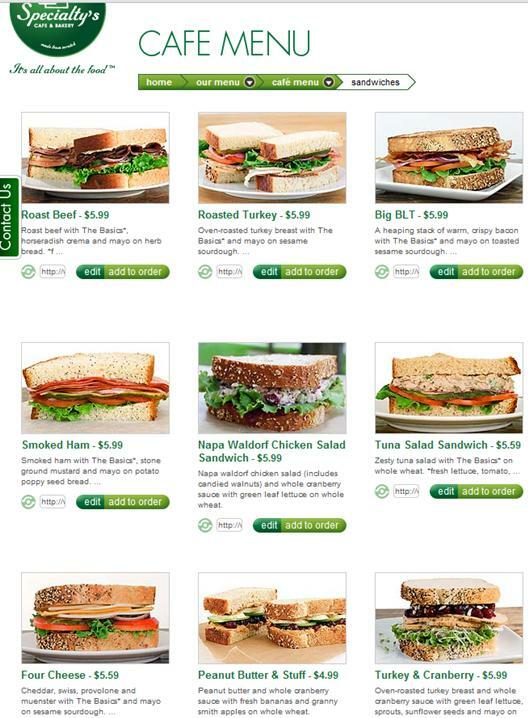 As I browsed through the sandwiches, I tried thinking like Daren did. What sandwich could I buy without wheat, dairy, nuts, or eggs? Immediately I adopted his approach of throwing out the bread. (Waah! The bread they bake is lovely, and it’s pure and simple!) And it looked like I would have to throw out the cheese as well. Wait! There was a peanut butter and banana sandwich–no cheese! Oh, but nuts. Okay, not peanut butter. If I threw out the bread, and the cheese, and asked for no mayo, I would be left with deli meat, lettuce, tomato, onion, and pickle. Wait, could I eat the pickle? Was it pickled using any wheat, like soy sauce contains wheat? I wasn’t sure, so I left off the pickle, too. What I was left with was pretty meager, and I knew I couldn’t order my favorite cookie to make up for it because of the wheat and eggs and butter. I paused. And sighed. And decided that I had pretended to be Daren for long enough and ordered the peanut butter and banana sandwich with a cookie. I cheated. I felt bad about it. This is what I mean by empathy. I felt bad about it. Empathy sounds all wonderful, but it’s powerless unless you try out the life of the person you’re trying to empathize with. You won’t experience the remorse of cheating on dietary restrictions if you don’t try to apply those dietary restrictions honestly. I tell people it’s similar to what an actor must go through when studying a character. It’s the act of leaving yourself behind and stepping into the thought-processes of another person. Make empathy a bigger part of your design process. Indi, your ability to empathize is something I have a lot of respect for. I’m a career counselor so I’m familiar with the importance of empathy but I haven’t thought of it from this perspective. I’m looking forward to your talk tomorrow evening at the Tinderbox meetup. Thanks for the fascinating insight into empathy and UX design.